My Mom loved cheering us on. She didn’t really understand sports, whether it was my brother’s football or rugby games or my cycling, yet she knew we were out there giving it our best shot. The first time she saw me race was in Lafayette, LA on a tight, winding two-mile course that was part of the Acadiana Festival. It was typical south Louisiana hot and muggy afternoon. I baked, withered, then fell away from the lead group and managed to finish in 9th place. I kept thinking I had the wrong gear set, hadn’t trained properly or didn’t have enough water the day before. It didn’t matter. Dejectedly, I pedaled over to her. She immediately hugged me and told me how much she enjoyed herself. I was drenched in sweat and disappointed in my performance yet I couldn’t help but smile. Mom found the beauty in the sport. She didn’t understand the tactics or technique but she certainly knew how to make me smile. Many years later, after Dad passed away, she started forgetting things. Small things at first, then larger things, such as the names of her grandchildren, where I lived, and what I did. Once we spent an entire week with her. We stayed with her, cooked and cleaned for her, drove her around town and took her to visit her friends. After we left and arrived back home in South Carolina, I called her to tell her that we were safely home. She replied that she would hurry and open her front door. Alzheimer’s stinks. A diagnosis is a death sentence. It doesn’t matter how old or young or healthy you are. It’s going to kill you, maybe slowly, maybe quickly. On the way to your death, you’ll forget everything that makes you special and unique. And you’ll slowly break the hearts of your loved ones. 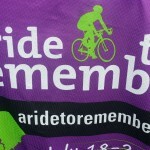 This July I’ll make my third bicycle trip across South Carolina in the Ride to Remember. Although me and my teammates will have a great time and see parts of our state you’d never see from the interstate, it’s still a fundraiser and I need to do my part and raise money. My goal is five thousand dollars. Let me remind you. Alzheimer’s has a 100% fatality rate. There are no survivors. And chances are that you’ve got someone near and dear to you that has or will have Alzheimer’s. If Alzheimer’s is going to be beaten, it’s going to take money. Your money. Won’t you please help me with a donation?